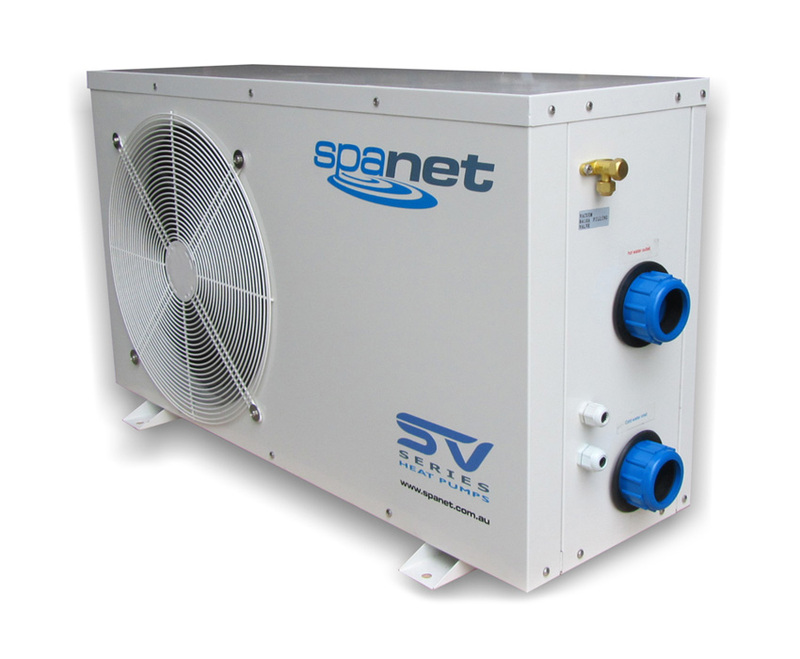 Our Heat Pumps are designed to help you get the most from your pool or spa by allowing you to affordably control the temperature -24 hours a day all year round. Just select the exact temperature you want and your heat pump will (within limitations) maintain that temperature automatically. Our Heat Pumps are designed to help you get the most from your pool or spa by allowing you to affordably control the temperature -24 hours a day all year round. Just select the exact temperature you want and your heat pump will (within limitations) maintain that temperature automatically. A reverse cycle function even allows you to cool the water in summer. More efficient than gas and electric heating, our heat pumps will save you up to 75%. Heat Pumps are not reliant on the sun and works in all conditions and temperatures, from minus 7 degrees to plus 43 degrees. At the heart of every heat pump are Panasonic compressors which are known for their quiet operation and reliability. You and your neighbors can relax knowing that your heat pump has an operating noise of around 50 decibels (about the same as a pool pump). Installation is simple. They look great and can be positioned to be unobstructive. Our Heat Pumps are not only environmentally friendly but also efficient as they use refrigerant gas R410a. Heat Pumps use less energy than most other pool heating options, which is better for you and the environment. Heat Pumps have a COP (co-efficient of performance) around “5” which means that for every dollar spent you get $5 worth of energy output. Heat Pumps use up to 75% less power than electric heating and are considerably cheaper than heating with gas. Over the life of a pool or spa your heat pump will save you many thousands of dollars. Heats AND Cools- with auto defrost: Our heat pumps allow you to not only heat your pool or spa in winter but can also cool your pool or spa to stop heat build-up and manage water temperature in summer. Hydrophilic Fin Evaporator: The efficiency of a heat pump, air conditioner or refrigerator is based largely on the thickness of the evaporator. Our heat pump evaporators are not only thicker then most brands but the blue coating on the evaporator fins helps repel water from the fins, reducing corrosion. Powered by Famous Brand Compressors: At the heart of any heat pump is its compressor. Our heat pumps use Panasonic compressors for efficiency and reliability. Toshiba Micro Chip Control System: Our Toshiba micro chip control system uses state of the art technology to ensure easy and automatic operation and precision temperature control. The control panel provides a continuous temperature display and also shows diagnostic error codes in the event of a problem, such as low water flow. Maximum Durability: Our powder coated galvanized steel cabinets are built to last. Superior components and strict quality control ensure maximum performance, reliability and durability. Environmentally Friendly R410A Refrigerant Gases: We use only environmentally friendly R410A gas, which is also the most efficient gas to use in heat pumps.